Originally uploaded by 6 Sloans. 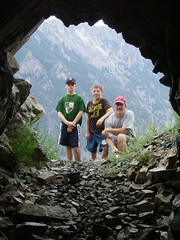 Me and the boys outside of an abandoned mine entrance in Montana's Beartooth Mountains. The mine went back about 150 feet. Some animal had made beds out of sage and pine needles in a couple of places; it smelled really good actually. We also found a dead kangaroo rat that was still pretty fresh. I'd be lying if I didn't say that it was a little eerie, especially when we turned off our lights. There are abandoned mines all over the West. At the risk of turning this post into a bit of a Public Service Announcement, I do think that if you're going to go into an abandoned mine, you should be aware of the potential dangers. Caves are pretty cool places (no pun intended). While this wasn't technically a cave, it reminded me of spelunking. They appear often in mythology and literature. What's your favorite underworld place – real or fictional?